Flindt Landing Camp is a remote fly-in/rail-in fishing lodge located on Heathcote Lake which is formed by the Flindt River system. Our lodge is at the southwest edge of Wabakimi Wilderness Park, and accessible by float plane from Savant Lake or by VIA Rail from Sioux Lookout or Armstrong. We are the only camp on 17 mile sheltered Heathcote Lake. We offer two modern cottages and three cabins on a wilderness island which is connected to the lodge by a 150' foot bridge. We also offer one secluded modern cottage on South Heathcote Lake. All cottages and cabins are fully equipped for housekeeping. Our guests are supplied with new 9.9 Evinrude outboard motors and 14' Naden or Lund boats. Because the are no roads into this vast area, the unspoiled wilderness of Wabakimi Wilderness Park offers pristine beauty, tranquility, untamed nature, abundant wildlife, and unrivaled fishing. Heathcote Lake has water ranging up to 150' deep with so many exceptional fishing spots it would take a lifetime to fish them all. Fourteen pound walleye and thirty pound northern pike have been caught at Flindt Landing, and many trophy size fish are caught and released every year. 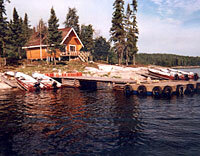 Flindt landing Camp has been owned, operated, and offering outstanding fishing by Dave Gish for 36 years. Dave, along with his daughter Patsy & Bob Collins, invite you to share this remote beautiful wilderness, an abundance if fishing action, and lasting memories.